Contemporary poets sometimes confront the taunting statements: free verse is not poetry–it has no rhyme, no meter. It’s simply prose cut up with line breaks. And beginning poets may also wonder: Where should I break the line? And how do I achieve a sense of rhythm without rhyme and meter? How do I get started? The author’s “personal take” is entirely approachable. Her style is conversational, colloquial, and elegant in the sense that the writing is easily understandable because the ideas and suggestions are stated clearly, logically, concisely with good sense and no clutter. This book would be equally helpful to an individual working alone or as a supplement to a class of aspiring poets in a workshop. 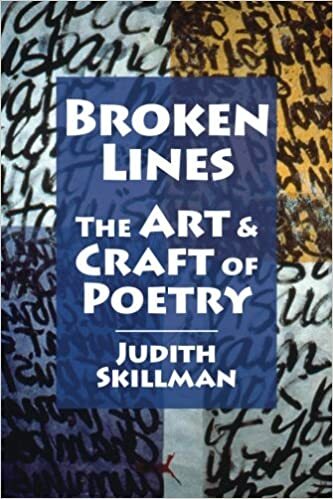 Obviously, Judith Skillman does not intend her book to be an all-encompassing guide to writing poetry. She has chosen to focus on the most immediate questions aspiring poets have–a discussion and guidelines for line breaks, how to vary structure in the context of free verse, search for the ars poetica poem, and steps required to facilitate the act of coming out of the closet. Her work is “rife” with examples that come in the form of successful poems, personal examples, quotations from other writers, and interviews pertinent to the subject under discussion. She includes strategies to support one’s motivation, to fight against the feelings of isolation, and suggestions of ways to broaden ones base of what to write about. Broken Lines is divided into 5 sections, each packed with helpful points supported by examples. Section 1 “Letting Go & Getting On” includes such topics as finding one’s subject to write about, breaking the lines, enjambment, caesura, associative writing, form and content, condensing and being concise, revising. Section 2 “Giving Writer’s Block the Boot” starts by suggesting that one can overcome angst by putting one’s feelings into an ars poetica poem, includes 20 ideas for writing a poem with accompanying example poems, ends with 7 suggestions for “Putting it All Together: Your Voice, Your Vision,” and a section on writing the occasional poem. Section 3 “The Spark: Collaboration and Inspiration” presents the idea that subject matter and enrichment of one’s writing can come through collaboration with other artists and gives examples of collaboration with a photographer, textile artist, visual artist, memoir writer, and includes an interview that discusses inspiration. Section 4 “Your Poetry Manuscript” discusses manuscript evolution–how to discover and develop a theme, how to order the manuscript, epigraphs, and creating front and back matter. And the final Section 5 “Maintaining Motivation” lists resources, ways writers can continue to write in the face of publisher rejections, marketing strategies, 20 tips for giving a poetry reading, and what to do if one feels the plateau has been reached. About the reviewer: Bonny Barry Sanders is the author of two collections of poems Touching Shadows and OctoberHouse, and a Civil War historical fiction Kiss Me Good-bye. Her poems have appeared in Connecticut Review, Carolina Quarterly, Florida Review, Hayden’s Ferry Review, Louisiana Literature, The Midwest Quarterly, Negative Capability, Plainsongs, South Carolina Review, South Dakota Reviewand many others. Her book reviews and essays have also appeared in many national literary journals. She is a resident of Jacksonville, FL and spends part of the year in her childhood home in Annapolis, MD.